"OK, let's get this done," he said, coming in for the farewell hug, careful not to get too caught up in the moment. He turned, walked back to his truck, and was gone. Kenny Jones came to Fort McMurray as a young, upstart, eager and single radio jock; he's leaving as a seasoned broadcaster, husband, father and community leader. He had made the leap of faith to come to our community from a spate of early-career placements in southern Ontario-coming for six months he stayed for almost 10 years. Hard work combined with an uncompromising belief in the radio business earned him an opportunity to move into the morning show where he became a Wood Buffalo institution. In a letter to his fans and friends posted on the radio station website (country933.com), the community learned that Kenny Jones and his family would be packing up their life and moving to Abbotsford, BC where he will assume the morning show controls at Country 107.1. His last shift is this Friday-he'll be broadcasting live from Smitty's, a weekly haunt for him and his family, a show that will be chock full of memories. I'll be on the VIA Transcontinental train and will miss the fun. Kenny's life in Fort McMurray broke down into four quadrants. There was his on air life-the show and all the preparation that went into creating great radio, day-in and day-out. There was his family life, loving and living with Erin and their two incredible children, Liam and Piper. There was his radio life away from the microphone and all it entailed, from attending and getting involved with an unparalleled number of community events and organizations to running the radio station halfway house, providing a sense of family and support to many young broadcasters far away from home, struggling to get their feet on solid ground. Finally, there was his running and his community theatre life, that portion of his existence that was completely personal and helped illuminate the depth of his character. I saw Kenny on stage for the first time at interPLAY when he lit things up in Greater Tuna. Completely rooted in his character, Kenny was a delight to watch, a completely natural force on the stage. 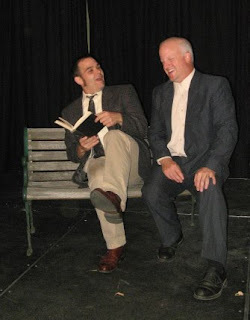 We worked together for the first time in 2008, playing brothers Ray and Roy in James McLure's Lone Star. The following year we tackled Edward Albee's The Zoo Story, Kenny played the uptight Peter to my psychotic Jerry. Earlier this year, we put it all together with Caryl Churchill's A Number, Kenny brilliantly played four very different characters-clones from a genetic experiment gone bad. Together, we have laughed, stressed over lines, pushed our characters to the limit, and explored the far reaches of trust on stage. Applause was earned, awards were won, and many comments were made about how good we were together. But it was in that proverbial circle of trust that we had the most fun, whether it was in front of the hot lights and a theatre full of guests, or in Darlene's basement garage rehearsing in the dead of winter. If success can be measured by memories and moments, and the impact one has had on others, Kenny will leave Fort McMurray on top of the world. For his listeners, he has provided a daily dose of fun for nearly a decade. For me, he has provided some of my favourite memories and moments on stage. For Mary, he provided smiles and a connection to the outside world, as she spent the final days of her life in the terminal ward of the Northern Lights Regional Health Centre-her son had brought in a portable radio so she could listen to Kenny in the Morning. "I don't do goodbyes," he said. "Let's just say 'later' and keep it at that." Really touches a chord in the heart!